Every morning I remind my kids to eat breakfast – and then I don’t eat one myself. I confess that a strong cappuccino is enough to propel me out the door each day, when I know – I know – it’s not smart. How to change my ways and correct this parental double standard? Well, if I had the fixings for this yogurt parfait in my refrigerator each morning, you can bet I would eat it. 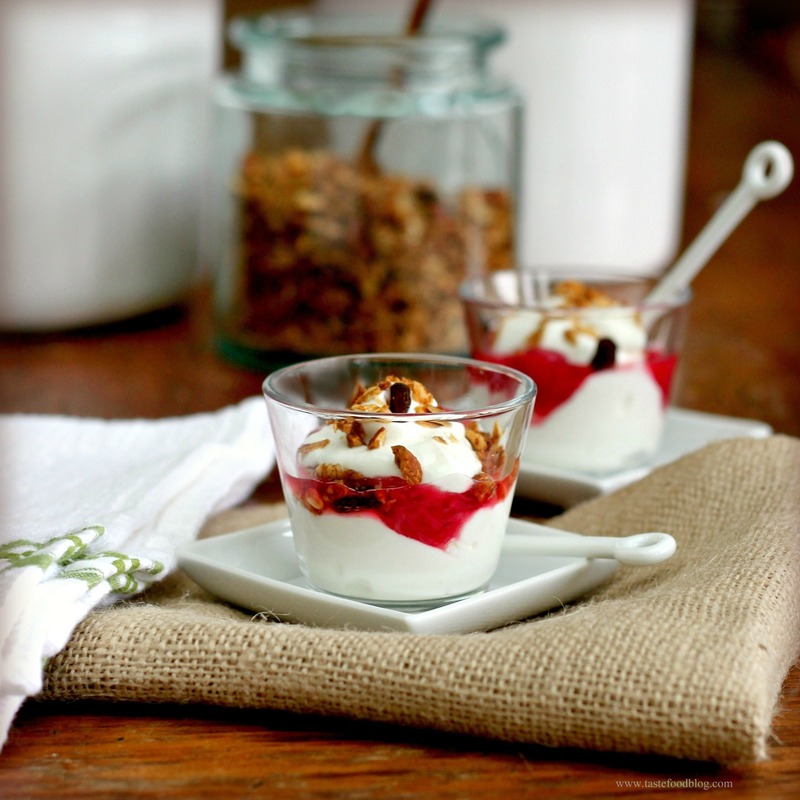 The good news is the compote and granola are easy to make in large quantities ahead of time. So no excuses. Eat your breakfast. This is delicious for breakfast, lunch or a snack. Feel free to double the quantities so you have extra on hand for breakfasts during the week. Combine all of the ingredients in a large saucepan. Cook over medium heat, stirring, until the sugar dissolves and the rhubarb begins to release its juice. Simmer, partially covered, until rhubarb is soft, about 20 minutes. Remove from heat and cool completely. Compote may be made up to 3 days in advance. Cover and refrigerate until use. Line a rimmed baking sheet with parchment paper. Preheat oven to 300 F (150 C). Toss the oats, almonds, coconut, wheat germ, cinnamon and salt together in a large bowl. Whisk oil, honey, maple syrup, brown sugar and vanilla together in a small saucepan over medium-low heat until sugar dissolves. Add to the oats and toss to thoroughly coat. Spread the granola on the baking pan. Bake until toasted golden brown, jiggling the pan once or twice, about 30 minutes. Remove and cool. Transfer to a bowl and toss with the raisins. Store in an airtight container at room temperature for up to one week. 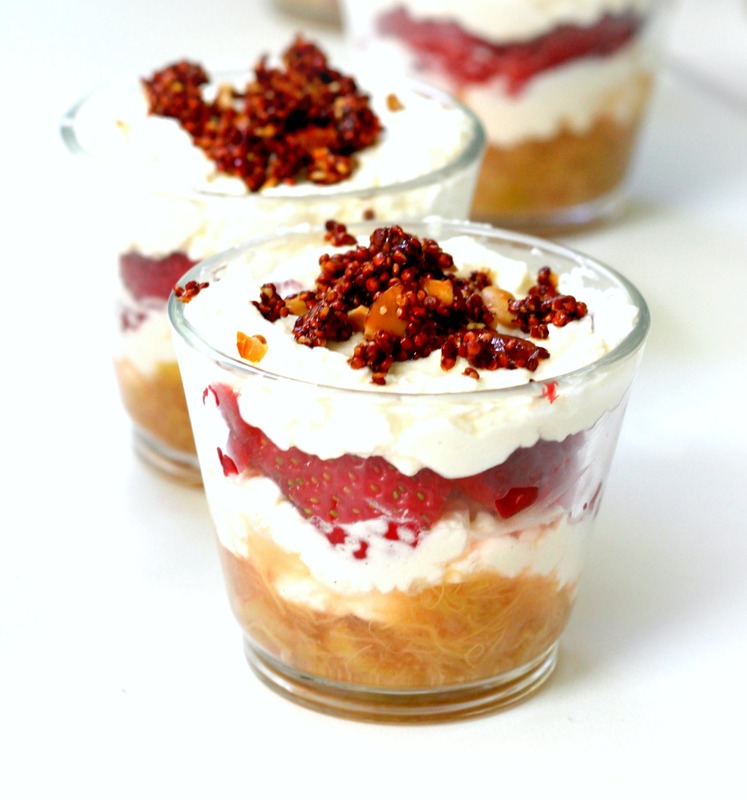 To assemble the parfaits, spoon alternating layers of yogurt, compote and granola in a glass, finishing with a topping of granola. It is strawberry season in our part of the world. The supermarkets and open air markets are displaying piles of luscious red strawberries, sweet and ripe, ready for eating. Before we moved here, our home was in Denmark, which would be considered (very) northern Europe. Summer is brief, and sunshine is not guaranteed. At this time, strawberries would be available, but were imported from France or Spain, as the Danish spring would still be in its early stages. Danish strawberry season is fleeting – primarily for the month of June – and for that one month we would gorge ourselves on strawberries. We would pick our own at the nearby organic farm, or stop at roadside rest areas where people would sell their garden harvests from backs of pick-up trucks and car trunks. While driving on country backroads, at the end of long rural driveways, we would find lone tables perched under tilted garden umbrellas shielding cardboard boxes of just-picked strawberries from the fickle Danish sun. We would select our strawberries and pay our money into an unmanned cash box – all transactions done on the honor system, of course. For this one month (if we were lucky, and it wasn’t a rainy season) we would stuff ourselves with strawberries. We would eat them plain and with cream, in trifles and pavlovas, in fruit soups and salads. When we gave up because we couldn’t eat them as fast as they arrived, we would freeze them for later in the year, as a tease and a whisper of our summer past. And, finally, when we began to think that we couldn’t possibly eat another strawberry, the season would be finished. Another fruit would replace it as the star of the show, strawberries would shift to the background and fade to a memory of summertime. Until the next year. In a mixing bowl combine mascarpone cheese, whipping cream, 2 tablespoons sugar and vanilla. Beat until soft peaks form. Cover and refrigerate up to 4 hours. 30 minutes before serving, combine strawberries and balsamic syrup in a bowl. Add 1 tablespoon sugar. Toss gently to combine. Let sit at room temperature for 30 minutes. Divide half the strawberries among 8 glass goblets. Spoon half the cream mixture over the strawberries. Top cream mixture with remaining strawberries. Top with cream mixture. Drizzle with any remaining syrup. Garnish with whole strawberries, grated lemon zest and mint leaves.